When Donald Trump announced that he would "drain the swamp" by filling his cabinet with lobbyists, billionaires, and political operators, we all braced for an onslaught of rules that benefited the fattest of cats at the expense of everyone else, but Gary Cohn outdid himself. 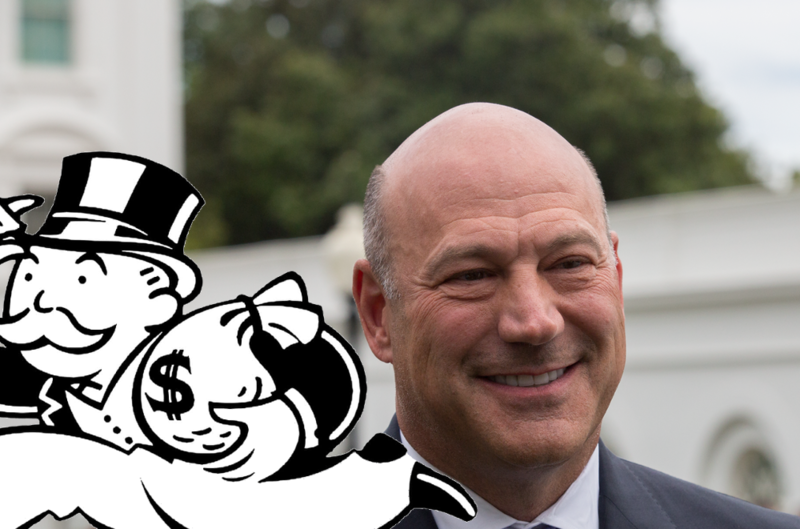 During the 14 months that he served as Trump's chief economic advisor, the former Goldman Sachs president helped deliver a 40% cut in corporate taxes (saving Goldman $1 Billion/year! ), as well as a tax-holiday on $3 trillion in corporate money stashed in overseas tax-havens, saving billions more for Goldman's largest clients. He also preserved the carried-interest tax loophole (which Trump promised to get rid of), ensuring that hedge fund managers would continue to pay a lower tax rate on their billions than their cleaners pay on the $7.55 they earn scrubbing toilets. Cohn delivered bigly for Goldman Sachs in other ways. Under Cohn, the administration eased the rules on initial public offerings — a step Goldman has long sought, as a firm that handles major public offerings, and one that is potentially worth hundreds of millions in additional fees to the firm each year. There could be more good tidings for Goldman and the other big banks in the $1.5 trillion infrastructure plan Trump unveiled at the start of the year. It places Wall Street firms at the center of partnerships between governments and private industry — welcome news for Goldman’s Public Sector and Infrastructure group, which arranges financing on large-scale public-sector deals. Goldman and other big investment banks are also in the business of debt-financing: a booming business as the federal government goes deeper into debt in the wake of Trump’s tax bill. There’s one major piece of business that Cohn’s departure leaves unfinished: financial deregulation. Yet even on this front, Cohn made great progress for Wall Street in his months inside the White House. The Consumer Financial Protection Bureau is now in the hands of an acting director intent on destroying it. And the Senate is poised to pass the Economic Growth, Regulatory Relief, and Consumer Protection Act, a deregulatory bill that rolls back significant parts of the Dodd-Frank financial reform legislation — clearing the way for the risky behavior that tanked the economy in 2008.